Maybe it's because this cold weather is so mind-numbing, but I can't stop making soup. It all started on Monday, with the roasted chicken that we had for dinner . On Tuesday, I broke down the bones and made a stock. Then I picked off all of the leftover meat hiding it the nooks and crannies and threw them in to a pot with said stock and some leftover rice and broccoli from the night before. I drizzled it with some olive oil, added some grated parmesan cheese and some fresh pepper. Voila! 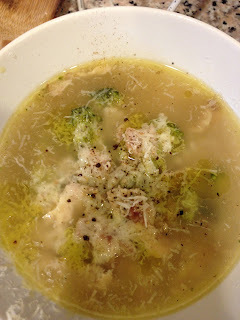 Classic Chicken Soup! 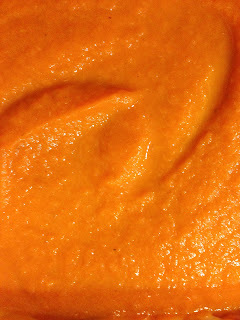 The next night, I was inspired by the big chunks of carrot left over from the original chicken stock, so I diced them. Then I dug a red onion out of the fridge and diced that too and sautéed it with some butter in a small pot. I added the carrots and sprinkled it all with some curry, salt and pepper. In went my handy, dandy chicken stock from Tuesday night. I let it all simmer together for an hour. Then, I pureed it all in a blender. Boom! Curried Carrot Soup! The next night, I spied a lone, chubby butternut squash in my basket of produce on the kitchen table. So I peeled it and I diced it and I spread it out on a roasting sheet and tossed it with a diced onion and three whole chicken thighs. That went in to the oven for thirty minutes. I pulled out the last of my chicken stock and poured it in to a big pot. The butternut squash and onion followed. 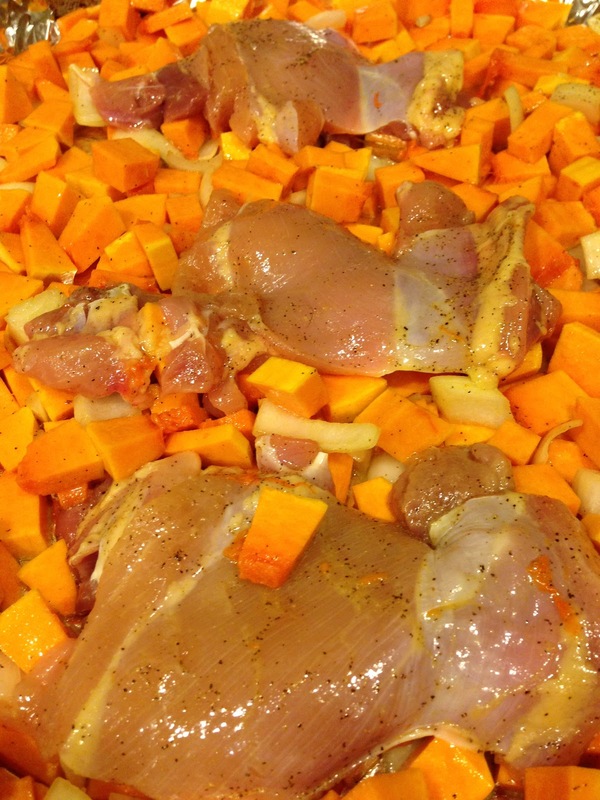 I diced the chicken thighs as the veggies boiled. When they were soft, I mashed them to make the soup more of a stew. I added the chicken, a squeeze of lemon and some cilantro to brighten things up a bit. Pop! 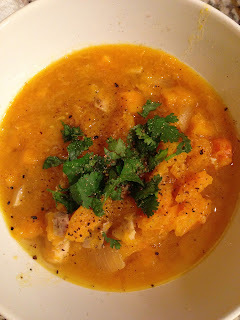 Roasted Butternut Squash and Chicken Soup. 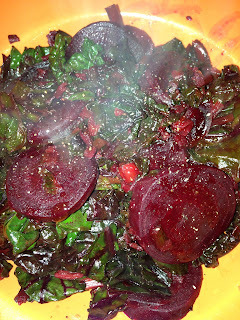 You can make this happen with a bag of lentils and a bunch of beets. Who wants to go outside in ten degree weather to find lunch? Or order bad Chinese? Instead, open your pantry, pull out some lentils. 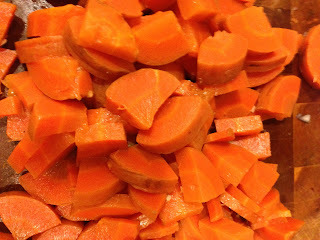 Soak them while you saute diced onion, garlic, carrots and red pepper in olive oil. Add the lentils and chicken stock to your pot. Season. Simmer. Done. While your soup is coming together, pull a bunch of beets out of the fridge. Break them down and slice them in to medallions. But don't throw away the greens. Clean and chop these too. 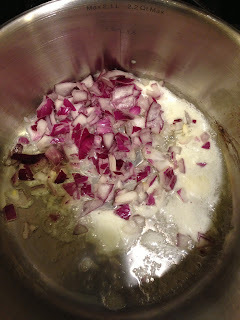 Throw it all in to a saute pan with olive oil and shaved garlic. Season. Stir. Done. If you have a brick of cheese to throw on the table for good measure, do it. 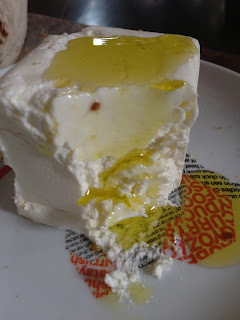 We had some robiola and drizzled it with olive oil. Warm some frozen bread. Pour some red wine. 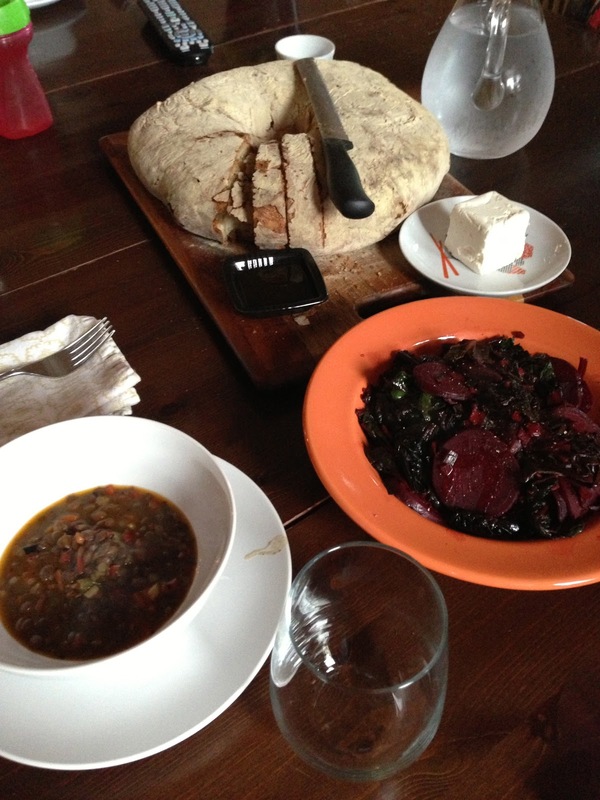 And have a hearty, healthy lunch that will beat anything you will find outside in the cold. Jada is good about going to bed. She is usually exhausted after a full day and willingly volunteers that she is "ready for a nap". We just have to work on enticing her to sleep in her own bed. It was too cold to go out for lunch with Jada today so Michele made a quick pasta. He opened the pantry and pulled out a box of sardines. Then he sautéed the fish with olive oil, garlic, salt and pepper at a low burn and set the pan aside to boil a box of linguine. 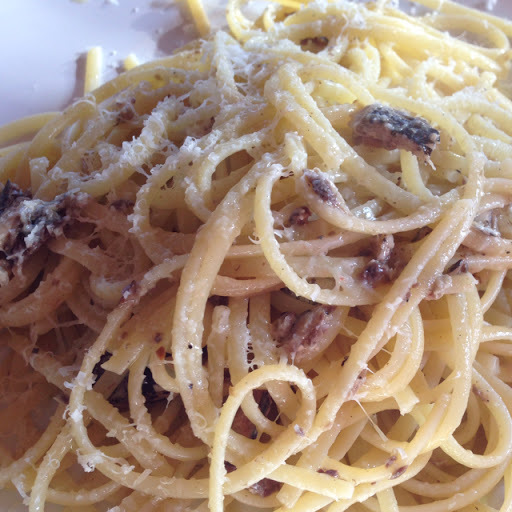 When it was almost al dente, he drew the pasta out of the hot water and tossed it with the sardines, plated it and dressed it with grated pecorino cheese. It was the best meal I've had all week, hearty, easy and satisfying! 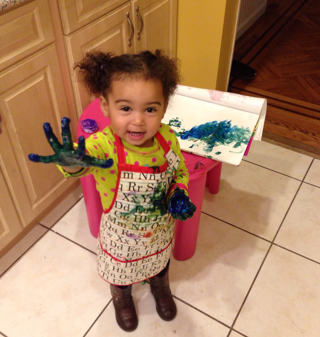 Jada has discovered finger painting and has embraced it in all of it's freedom. She finger paints to play. She finger paints to entertain, inviting Ryan to join her when he stops by. She finger paints to occupy herself when I'm cooking. She practices writing her letters and happy faces in broad strokes. She finger paints to "make hands", her favorite new trick. When Jada paints I realize that she is a bona fide toddler, "a big girl", autonomous, expressive and growing up fast. It's bittersweet. If you live or work in Brooklyn and you need to step away from the madness of modern life, slow down and pamper yourself, go to D'Mai Urban Spa in Park Slope. You will step through a small glass door in to an oasis. You will be greeted by the soft-spoken staff, gentle music and the soothing scent of gardenia. You will be led across the threshold on a wood-planked passageway to a space where they will relieve you of your exterior burdens, coats, bags, shoes and invite you to slip in to a warm terrycloth bathrobe and soft slippers. You will be invited to refresh yourself with a small glass of cucumber water and offered a hot shower or sauna before your treatment. If you like rigorous deep tissue massage, you will see Richard or Vanessa, but all of the therapists are superb. Irena will be available if you prefer a rebalancing facial or body polish. You will leave your treatment nurtured, centered, slower and at ease and you will be invited to linger as long as you'd like, to enjoy a cup of tea perhaps or more time in the sauna. You will not be the same as when you came. You will be better, more relaxed and more yourself. You will want to come back again soon. My nephew Ryan is a super finicky eater. So when I babysit him, I have to be very strategic about what I make for dinner. Anything too unfamiliar will be rejected outright, but I always try to push the envelope a little bit and nudge him gently past his comfort zone. 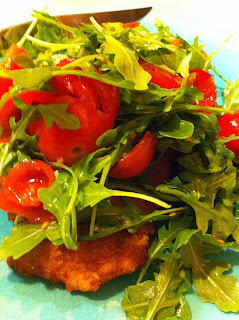 On this particular night, I decided to make chicken cutlets, safe territory, but topped with arugula and cherry tomatoes. I laid out the groceries on the kitchen counter and told him what we were having for dinner. He pointed accusingly at the small carton of cherry tomatoes, "What's that?" He shook his head, "But I don't like tomatoes. I only like chicken, rice with ketchup, broccoli and pizza." "Ok, but did you know that you can make ketchup in your mouth?" "Huh?" I had his attention now. "Ketchup is made from tomatoes. If you chew tomatoes, you can make ketchup in your mouth! You wanna try?" "I don't know...", he was skeptical. I popped a tomato in my mouth. Jada ate one too. "Mmmm! 'Matoe! ", she said as she chewed and reached for another. Ryan reluctantly put one in his mouth and started to chew. "See?" I told him. "Ketchup, right?" He still didn't look convinced. So I tried a new tactic. While he was still chewing, I sat him down at the little table that I had set up for he and Jada in the kitchen. "Here." 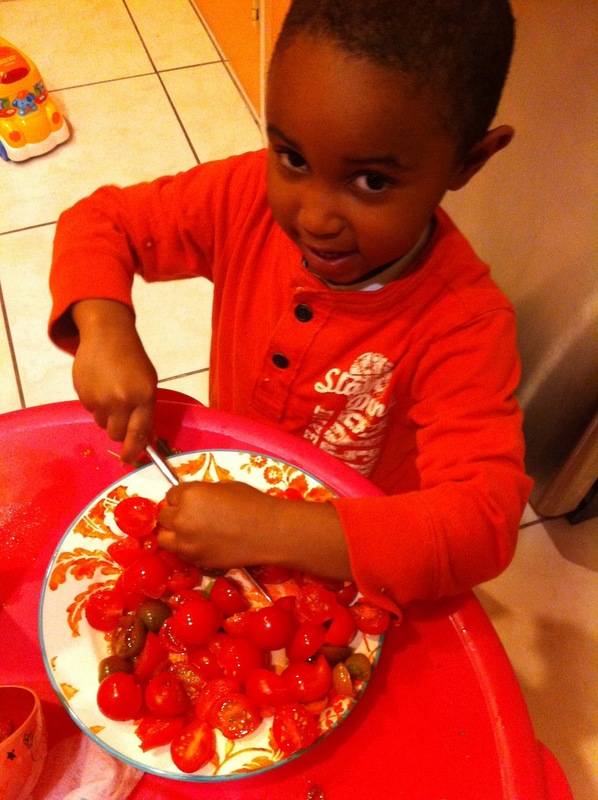 I put a plate of tomatoes in front of him and handed him a butter knife. "You wanna help me cook?" Ryan went to work cutting the tomatoes while I prepared the chicken cutlets. The cutlets didn't take long and when I put all of the ingredients together and gave him a plate of his own, he sat down with Jada and said proudly, "I made this!" and picked up his fork and proceeded to eat, uncohersed. "You like it, Ryan?" I smiled. "I'm eating chicken with ketchup! ", he replied with a full mouth, still defiant. He gave me a thumbs up and proceeded to clean the plate. Everyone eats cotechino on New Years Eve in Italy. It is akin to turkey at Thanksgiving, a holiday staple, so of course we served it at Va Beh' this year, to rave reviews. 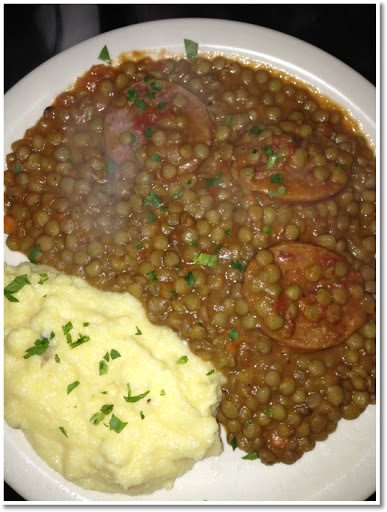 Lentil and pork are two symbols of good luck and both are combined in this dish: The pork is served as large sausage, in the shape of medallions, and resemble large coins laid on a glistening bed of savory, braised lentils. We ate enough for everyone that night! So here's to your good fortune in 2013!